Go ahead work your best every day with the durable construction and interior comfort of the Dr. Martens® Crofton Lightweight Heritage industrial work boot. Style numbers: 24008001 (Black) and 24008220 (Tan). 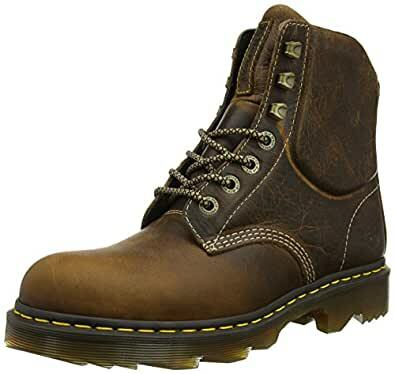 Non-safety toe utility work boot. Greenland leather upper is a natural leather with a waxy surface and a subtle, worn finish. Features classic Doc’s DNA including grooved sole edges, visible yellow stitching, and a scripted back pull loop. Padded collar with memory foam for optimum fit. Cushioned SoftWair II insole with superior cushioning and antibacterial properties for odor protection. EVA midsole provides added support and shock absorption. PVC outsole with rugged lug patter for superior traction. Product measurements were taken using size UK 11 (US Men’s 12), width M. Please note that measurements may vary by size.